・NEW! 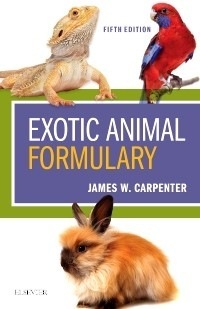 Chapter on backyard poultry and waterfowl, an increasingly popular pet in the U.S.
・UPDATED Chapter on wildlife includes new information on: considerations for developing a wildlife policy in private practice; recommendations for safe restraint of native wildlife; recommendations for meat withdrawal times in game species for select medications; agents used in wild mammal emergencies; and much more. ・NEW! Information details the euthanasia agents used in fish. ・NEW! Information on amphibians includes the blood collection sites and the selected disinfectants for equipment and cage furniture. ・NEW! Information on hedgehogs includes common differential diagnoses based on physical examination findings and confirmed zoonotic diseases carried by hedgehogs. ・NEW! Information on the constant rate infusion (CRI) protocols used in rabbits. ・NEW! Information on the protein electrophoresis values for ferrets. ・NEW! Information on compounding pharmacies. ・Nearly 200 drug tables provide clear, current recommendations on drugs, indications, and dosages used in treating exotic animals. ・Biological tables provide details on therapies and diets, normal blood parameters of common species, venipunctures sites, and medical protocols for common conditions. ・More than 20 expert authors contribute to this edition. ・All drug information is reviewed for accuracy, ensuring that this reference remains authoritative and current.